When it comes to certain products, there's often a clear consensus on the best choice for most people. This "Quick Take" report finds that to be the case in the roasting pan category. We like the one we recommend so well that we're going to add it to our kitchen before the holidays. The Cuisinart MCP117-16BR MultiClad Pro 16-inch Roaster is a high-quality roasting pan that can often be found on sale for less than $80, making it a terrific bargain, too. It's a top performer both in the oven and on the stovetop for searing and gravy-making. The stainless steel construction is solid and durable and it includes a rack. This Cuisinart roaster is large enough for a 15-pound turkey. Roasting pans take center stage at Thanksgiving, but most cooks use a roaster year round for other types of poultry and large cuts of meat. The best roasting pan includes a rack and will be slightly larger than the largest item you need to roast (for the proper air circulation). Stainless steel, not nonstick, is preferred for more flavorful gravies and sauces. While the consensus clearly shows that the Cuisinart MCP117-16BR MultiClad Pro 16-inch Roaster is the best choice in this category, if you have a smaller stove, or are just cooking for one or two, the Calphalon Tri-Ply Stainless Steel 14-Inch Roaster with Rack and Lifters (Est. $100) is a terrific alternative. Lesley Stockton tests 11 roasting pans by cooking turkey, chicken and veggies. A top choice and three runners up are named, either as upgrades or as a cheaper option for occasional use. Editors of Cook's Illustrated test seven roasting pans for performance and for design and handling. One is Highly Recommended, two are Recommended (with one being named a Best Buy), one is Recommended with Reservations, and three are Not Recommended. There is a wide variety of roasting pans available for sale at Amazon.com and most get reviews that number in the hundreds. Top-rated products are easy to spot and reviews tend to be detailed and helpful. BedBathandBeyond.com carries fewer roasting pans overall than Amazon.com, but reviews tend to be just as detailed. In addition, reviewers can say if they would recommend the salad spinner to a friend. 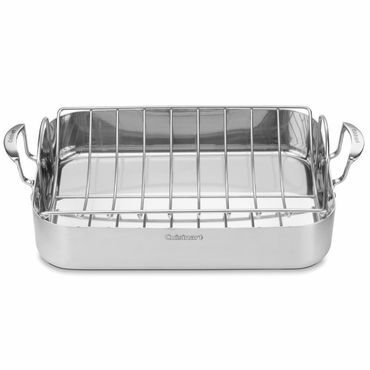 WilliamsSonoma.com is a popular destination for high-end roasting pans. Pros and cons are included and reviewers can include demographic information that includes their cooking skill level.